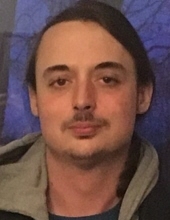 Matthew William Jones, 29, passed away Thursday, March 28, 2019 at his home in Corydon. He was born March 9, 1990 in Louisville, Kentucky the son of Rodney and Barbara Fritsch Jones. He was an employee of Data Network Technologies in Corydon for 10 Years. He is survived by his parents and his sister, Shannon Jones (Matt Johnson) of Corydon, IN. Funeral services will be held at 2 PM, Saturday, March 30, 2019 at Gehlbach & Royse Funeral Home in Corydon. Burial will follow in Central Cemetery in Central, IN. Visitation will be on Saturday from 10:30 AM until the service at 2 PM at the funeral home in Corydon. To send flowers or a remembrance gift to the family of Matthew William Jones, please visit our Tribute Store. "Email Address" would like to share the life celebration of Matthew William Jones. Click on the "link" to go to share a favorite memory or leave a condolence message for the family.